PM announces plans to vote on contentious draft law, says details of bill will be worked out only after preliminary vote. A new draft law aimed at settling the status of yeshiva students and their deferments from army service will be brought to the Knesset for a vote next week, even before a final version of the bill has been agreed upon by coalition members, Prime Minister Binyamin Netanyahu said Sunday afternoon. Speaking at a coalition meeting, Netanyahu said that the bill proposed by a special committee formed at the behest of Defense Minister Avigdor Liberman (Yisrael Beytenu) – which included senior IDF officials and members of the Defense Ministry – would be brought for a preliminary vote in the Knesset next week, despite the lack of an agreement among coalition members over the final version of the bill. For years, the Israeli government has struggled to resolve the issue of army deferments granted to full-time yeshiva students. Following rulings by the Supreme Court in the 1990s, the government formed the Tal Committee, which ultimately produced the Tal Law, approved by the Knesset in 2002. The law aimed at resolving the legal issues cited by the Supreme Court, which ruled that the renewable, open-ended draft deferments for yeshiva students constituted discrimination. The Tal Law, originally intended to last five years, included measures encouraging haredi men to enlist in the army or join the job market, without curtailing the deferment program. The law was struck down by the Supreme Court in 2012, after the Knesset renewed it in 2007. In 2014, the Knesset approved a modified draft law, imposing limits on the number of deferments issued, capping the system for the first time since the 1970s. A year later, the new coalition government stripped the draft law of most of the limitations imposed in the 2014 version. In 2017, however, the Supreme Court struck down the 2015 amendments, giving the government one year to pass a replacement. This March, haredi coalition members pressured the government to pass a proposal which would circumvent the Supreme Court, enabling the 2015 amendments to be retained despite the court’s ruling. Opposition from Liberman’s Yisrael Beytenu party, however, torpedoed the effort. Now, a plan being advanced by Liberman would largely retain the deferments program, while increasing punishments for draft dodgers, benefits for draftees, and imposing economic sanctions on yeshivas whose student bodies do not meet induction goals set by the government. Haredi lawmakers have objected to the proposal, and vowed Sunday to vote against the bill next week. 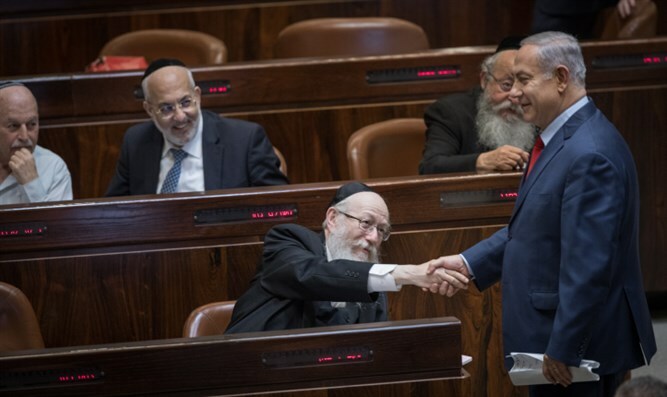 According to a report by Kikar Hashabbat, Interior Minister Aryeh Deri (Shas), Deputy Health Minister Yaakov Litzman (United Torah Judaism), and MK Moshe Gafni (UTJ) informed the Prime Minister of their plans to vote against the bill. To counterbalance opposition from the haredi parties, the coalition is lobbying members of the Yesh Atid party, which is not a member of the government, to vote in favor of the bill. During Sunday’s meeting, Netanyahu told coalition faction leaders that the final version of the bill would be decided upon only after next week’s preliminary vote.